"My all-time favorite collection of poems . . . [Gibran's] poetry always roots me in my humanity." --Rupi Kaur, #1 New York Times bestselling author of Milk and Honey and The Sun and Her Flowers A stunning new hardcover edition--with a full linen case, copper stamping, turquoise gilded edges, and colored endpapers--of one of the world's most beloved and popular spiritual classics, featuring a new foreword by Rupi Kaur The most famous work of spiritual fiction of the twentieth century, The Prophet is rooted in Kahlil Gibran's own experience as an immigrant and provides inspiration to anyone feeling adrift in a world in flux. As a prophet named Almustafa is about to board a ship to travel back to his homeland after twelve years in exile, he is stopped by a group of people who ask him to share his wisdom before he leaves. In twenty-eight poetic essays, he does so, offering profound and timeless insights on many aspects of life, including love, pain, friendship, family, beauty, religion, joy, sorrow, and death. 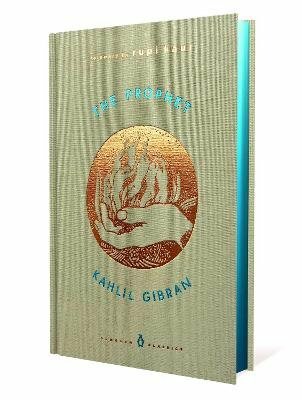 An immediate success when first published in 1923, The Prophet is a modern classic, having been translated into more than forty languages and sold more than ten million copies in the United States alone. The message it imparts, of finding divinity through love, made it the bible of 1960s culture and continues to touch hearts and minds across generations and national borders. This edition is illustrated with twelve of Gibran's famous visionary paintings and features a foreword by Rupi Kaur. In the sweetness of friendship let there be laughter, and sharing of pleasures. For in the dew of little things the heart finds its morning and is refreshed.